So mermaids have been in a lot of Junior/YA materials lately. I really like the idea of mermaids, and I know how vastly different one interpretation of these creatures/beings can be from another. I’ve been interested in reading something on the topic for awhile now, but I hadn’t found any that I’ve been really drawn to. I have tons on my to-read list right now, and wasn’t sure I wanted to get too deeply involved in a story of this kind just yet, so ultimately I decided to try out a Junior take on the subject, and read Real Mermaids Don’t Wear Toe Rings by Hélène Boudreau. Summary as follows: 14-year-old Jade has just gotten her first period. It’s embarrassing enough, but after taking a bath to relieve her cramps, and falling asleep in the water, she’s realized something much more horrific: she’s also just gotten her first mermaid tail. Finding out she’s a mermaid is not something Jade enjoys, particularly because she hates water…due largely in part to the fact that her mother drowned a year ago. But the news might not be so bad. Jade inherited her mermaid-ness from her mother, and mermaids can’t actually drown…right? Soon Jade has a lot to worry about: lying to her super-sweet best friend, figuring out her feelings for a cute but previously-evil boy, and discovering the truth of her mother’s drowning. All while learning how to fit in as a half-human, half-mergirl. So…I actually really liked this story! It’s a hard review to write, because this is one of those tales in which I don’t really have any specific reasons why I enjoyed it. I found the writing good for the audience, definitely not too juvenile for Jade’s age, which is sometimes a problem in books for this age group. The issues she faces are, mermaid-tail aside, realistic, and the fantasy and realistic elements are drawn together well. The ending also surprised me…it is not a total twist ending, but unexpected enough to make me smile. This is also one of those books in which the characters are, for the most part, nice people. There is one not-so-nice character, which is okay, but mostly everyone is understanding and believing, which eliminates a lot of potential drama. It was a fun read, with some interesting facts (depending on your beliefs) about the history and evolution of mermaids. It’s the first in a series, and I’ll definitely check out the next book (the third is out in 2013, I believe). 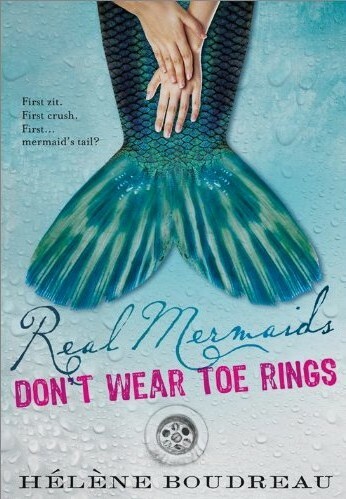 Nothing too deep, Real Mermaids Don’t Wear Toe Rings is just a fun coming-of-age tale, with some other tails thrown in. Summer’s over, but it’s a great summer read, so definitely a good fit if you’re missing the beach as the temperature drops! My daughter is a HUGE mermaid fan, and this sounds like something she'd love. Thanks for the recommendation! This sounds like a very cute book. The title is great too. I'll have to remember it. Thanks for sharing. Hi, just came over to say hello because of the Liebster award, but love the review. Mermaids and toe rings, interesting thought, lovely title. Oh wow, thank you Tamara! I will have to do my own post for it soon! And thank you for all the thanks, =) …yes, I enjoyed this book, it was just a cute, fun read!